He’s been little heard in the US for generations. Does that make him an underused gem – or one best left to obscurity? Thanks to Paul for suggesting Bertram as Name of the Day. The most famous Bertram might just be Bertram Wilberforce Wooster – a.k.a. Bertie Wooster, of PG Wodehouse’s beloved Jeeves & Wooster series. If you haven’t read them, they’re lighthearted comedies about an early 20th century English gentleman and his gentleman’s gentlemen, the indomitable Jeeves. Bertie gets into all sorts of trouble, sometimes with the assistance of Aunts Dahlia and Agatha. No matter the mishap – an unintended engagement, trouble with a silver cow creamer and so on – Jeeves manages to save the day. Of course, the adventures of a good-hearted but bumbling fictional character are not enough to encourage use of a name. Or discourage, for that matter. During Bertie Wooster’s heyday, Bertram ranked in the 300s and 400s in the US. That’s not popular, but it is far from obscure. He also has a lovely meaning. From the Germanic elements behrt – bright – and hraban – raven – the name implies wisdom. 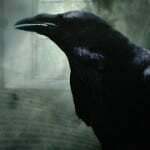 While ravens today conjure up Edgar Allen Poe and professional football, once upon a time, a raven’s image was akin to an owl – wise. There’s also English philosopher Bertrand Russell. Both the French and English versions are sometimes seen as a surname, also spelled Bartram. While Bertram was in steady use for much of the late nineteenth and early twentieth centuries, he was fading by the 1940s. Rare is the Baby Boomer named Bertram. And a Generation Xer would be truly unusual. Bertram left the US Top 1000 entirely after 1970, just months after Bert made his debut on Sesame Street. It’s impossible to link the two – Bertram was well on his way to obscurity by the time the Children’s Television Workshop named their now famous charaacters. But it surely didn’t help parents reimagine the name, either. In fact, Bert has fared better than Bertram over the years, ranking in the Top 100 back in the nineteenth century. Add in Herbert, Robert, Albert and Burt and he was once fairly common. I’m divided on how well he might wear today. Everything old is new again, and Bertie seems like a fabulous nickname for a small boy. But would Bert be a burden? I’ll leave that to the discussion. Like this name a lot, although i do not think i would be brave enough to use it. This name says Jane Austen to me – i.e., the Bertram family in Mansfield Park. I immediately think of Bertram Cooper from Mad Men… not that that’s a bad thing. D’oh! I’ve been obsessively catching up on Season Two over the past few weeks, and I didn’t even think of him! Thanks, Amy. Too stuffy for me, almost to the point of being a charicature or stereotype: Bertram. Godfrey. Reginald. Alistair. There’s a handful of names that I can only picture on a fictitious butler or in Victorian England. I have been seeing Bertram more and more in the Birth Announcements lately. Of course, never as a first name but always a middle name. Its nms, but if I met a little boy named Bertram, I’d probably be excited. I do like the meaning more than I actually like the name. My father’s name is Bernard, a name I’ve thoroughly grown to dislike for reasons unbeknownst to me, but I do like Bertrand and Bertram as ideas for honoring him. I like Bertram and Bertrand and have yet to meet one or the other. I’m generally not into nicknames and I don’t care for Bert. Definitely would use the full name. I’m an avid Wodehouse reader, and so I like Bertram on a purely sentimental basis. However, I think that any contemporary bearer of the name would have to insist on it in full as he gets older, which would make the whole thing rather tedious. Agatha Christie published a Miss Marple mystery called “At Bertram’s Hotel”, but it doesn’t feature any actual Bertram. Sigh – Hugh Laurie. It seems to me the ‘right’ person could wear Bert well in adulthood (agreed that Bertie is cute on a li’l one);but how do you know your baby will be able to pull it off decades before he’s finished developing his personality? I like it on some levels, but think it would take a bit of daring to go for it up front.